The custom of offering incense to Buddhist deities using long-handled censers appears in Gandharan stone sculpture as early as the 2nd century. Long-handled censers were introduced to Japan from Tang China, where censers with unadorned ends, resembling the tails of birds, or those with lion-shaped counter balances were most popular. 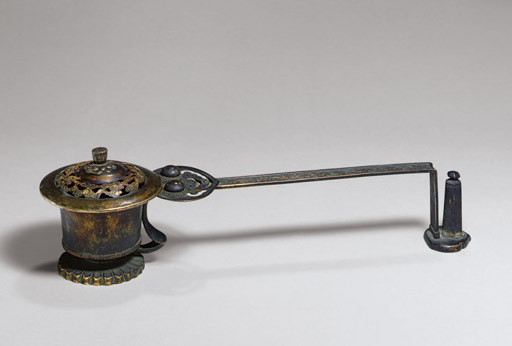 Soon after, Japanese bronze casters began producing long-handled censers modelled after the Tang-dynasty prototype. By the Heian period, the counter balances were gradually changed to a simple water pitcher shape which remained the popular style until the Edo period.